Home / Unlabelled / Gordon on President Duterte: Don't focus on what he says, Focus more on what he does! 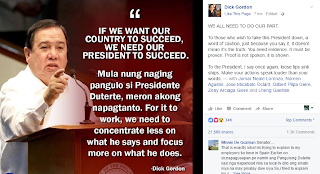 Gordon on President Duterte: Don't focus on what he says, Focus more on what he does! 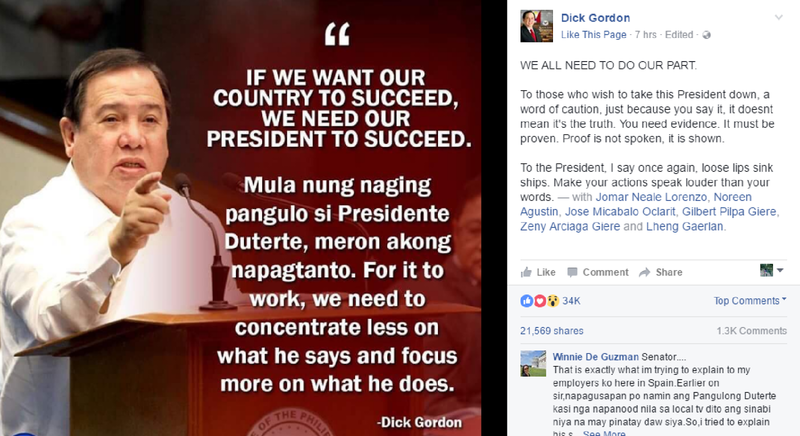 Gaining over 21 thousand shares and 35 thousand likes in just 7 hours, Senator Gordon made his statement trending in social media. He emphasized and adviced everyone to not focus on what President Duterte says but on what he does. He also said that if we want our country to succeed, we need our President to succeed. Clearly, he meant to pass this message to those who criticized him and his administration to have second thoughts on their judgements of him because having the President in the office for just a couple of months made it clear to us and every Filipinos that he fulfill what he promised during his campaign.